Ask anybody to name a famous cycling race and 99% of people will say the Tour de France. Ask a cycling fanatic to name the most famous cycling sportive and they are likely to say the Etape du Tour. The Etape du Tour gives amateur cyclists a chance to ride a stage of the Tour de France, just days before the pros. This is a bucket list event for nearly every keen cyclist. This year features an iconic route between Albertville, host of the 1992 Winter Olympics, and the beautiful ski village of Val Thorens in Le Trois Vallees. This beautiful route will see cyclists climbing the Cormet de Roselend giving stunning views over the crystal blue waters of the Lac de Roselend, before an awesome descent into the valley, followed by an ascent of the Notre Dame de Pre. Riders will then descend into Moutiers, before a grueling climb into the heart of the 3 Valleys and up into the skiing village of Val Thorens. The battleground for the Etape du Tour 2019 takes place in the heart of the French Alps on the 21 July. It is a 135km route featuring 4563m of climbing. The route will see riders cycle out from Albertville and through the quaint town of Beaufort, famous for its cheese. Riders will then ascend the Cormet de Roselend from Beaufort, a 20km climb with a vertical ascent of 1227m (average 6% with 10% sections). The climb begins fairly gently before it kicks up for 10km of ascent through the forest and out onto the Col de Méraillet. From here, it flattens out a little and you will be rewarded with stunning views over the lake below, before the 6km to the summit. Riders will then head into Bourg St Maurice and up to Longefoy and the Notre Dame de Pre topping out at 1,311m before descending into Moutiers. From there, it's an epic 35km into the heart of Le Trois Valles passing through St Martin de Belleville, Les Menuires and up into Val Thorens. Last year, the Etape du Tour sold out within one week of release to the general public. As official operators of ASO, the organisers of the Etape du Tour and Tour de France, we have guaranteed packages to offer, before any packages or entries are released to the public. We have a set number of entries and packages which we expect to be sold out immediately, as we have experienced in the last few years. Guarantee your entry space now, along with one of our packages. We have 3*, 4* and 5* hotels and apartments available based in Val Thorens, right next to the finish line. We will also be providing shuttles to registration on Saturday as well as to the start on Sunday morning (about an hour's transfer), group guided ride on the Saturday, race briefings and support staff available all weekend. Airport transfers, as well as bike carriage, form the UK will also be available. We are here to help you get the most out of your Etape du Tour experience so book now. Geneva airport is where we advise our clients to arrive into and it is wells served by all major airlines. We will have transfers at specific times throughout the day from the airport up to our accommodation in Val Thorens (approximately 2 hours). Our transfer vehicles will be able to transport your bike and luggage but we strongly suggest you make use of our partners Sherpr, who can provide door to door transportation of your bike. Every year thousands of bikes don’t get put on aeroplanes so take the hassle out of traveling with your bike, and worrying as to whether it will make it off the flight. Click here to use Sherpr’s service and use code LOVEVELO10 for 10% off. We have a wide selection of accommodation available (see below) on self catering, bed and breakfast and half board basis. After breakfast, we will be providing transfers down to Albertville (approximately an hour) where the EXPO and registration area are situatetd. You will be able to register at the Halle Olympique in Albertville. For those that would like to do this early and ride today, we will be offering guided riding in the afternoon. The guided ride is likely to be 30-50km in length to spin the legs and take in some beautiful riding in Le Trois Vallees. After an early breakfast, we will be providing shuttles down to the start to ensure everyone is ready in their pens for the start. Please note, we have no influence over your starting pen as the pens are allocated by the organisers. They group riders according to historic Etape timings or your predicted finish times. Faster riders will be in the first few pens with slower riders at the back. The Etape du Tour is on completely closed roads and there will be water stops on the route, as well as mechanical assistance in certain areas. All our accommodation is based in Val Thorens right by the finish line meaning you finish the ride and head straight to your bedroom for a warm shower, something to eat and to change out of your cycling gear. There is no waiting around for return transfers or having to ride back down the mountain after a tough race. We couldn’t be better positioned for you to enjoy the end of the race. After breakfast, we will be providing transfers back to the airport or if you are making your own way home, check out will be mid morning. Airport transfers and bike carriage from the UK is also available. Please contact us for this pricing. 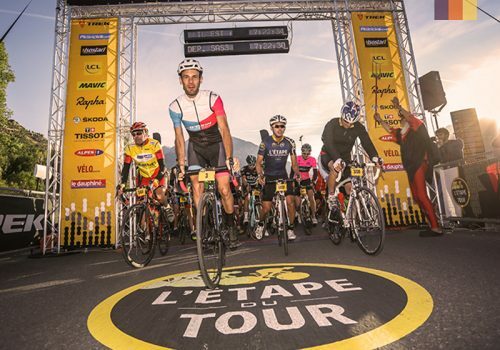 The Etape du Tour takes place on 21st July in the French Alps. The route for this year's Etape has a similar weather pattern throughout. July is the warmest month of the year in Albertville, Beaufort and Val Thorens, with temperatures reaching the high 20s. Rainfall is higher than Spring but still quite low so this year's riders should experience warm and sunny riding. Descents off the climbs are likely to be cold and fresh so we recommend bringing arm warmers and gilets as well as a shell rain jacket. The 2019 Etape du Tour takes place between Albertville and Val Thorens. It is a 135km with 4,563m of climbing in one of France’s most stunning regions. Ride a stage of the Tour de France just days before the greatest cyclists in the world tackle the mountains between Albertville and Val Thorens. Entering its 29th year, the Etape du Tour is one of the most popular and celebrated sportives in the world. With previous years in the alps proving to be so successful, the famous sportive will make a return to eastern France, guiding riders through the unique, mountainous region including climbs up the Cormet de Roseland (1968m) and Cote de Longefoy (1190m). Val Thorens, the summit finish at 2365m, provides riders with a challenging but beautiful end to the 135km ride. A constant feature of the ride will be the local French residents, spurring you on and providing the added motivation to get you to the finish. Enjoy riding through the authentic local towns and through the contrasting but equally beautiful valleys. The French Alps provides a riding experience you will never forget. As official travel operators of ASO, the organisers of the Tour de France and the Etape du Tour, we have guaranteed race entry included in all our packages. We have only a set number of race entries and expect these to be sold out, along with all our packages very quickly. We have a variety of accommodation by the finish line in Val Thorens. We have apartments in 3, 4 or 5* accommodation, with options of self catering, bed and breakfast and half board. Please see our pricing above. We will be providing return transfers on the Saturday from Val Thorens to Albertville, to enjoy the village and register for the race. We will also be providing transfers on the morning of the race to the race start. We will have support at the event to provide you with race briefings, last-minute tweaks to your bike and general assistance to make your Etape du Tour experience the best it can be. We will be providing a guided ride on the Saturday to enjoy some of the best riding in the French Alpine skiing villages. Our guided rides will likely be a 30-50km ride to spin the legs and get ready for Sunday's race. We will be providing airport transfers from Geneva and will be confirming times and cost closer to the time. We also have the ability for you to have you bike delivered to the hotel directly with our partner Sherpr. We highly recommend this as every year, thousands of bikes don't make it on to the location. Airlines can only take a certain number of bikes in the hold, irrespective of whether they have accepted your bike on to the flight as part of your booking. Take all the hassle out of taking your bike to the airport, and worrying whether it will turn up by using Sherpr. Click the link below and use code LOVEVELO10 for 10% off.